Is this the most useful touchscreen ever? Windows 8's future lies in touchscreen devices, but Microsoft's army of OEM manufacturers haven't exactly done a great job of building the perfect laptop. There's been some notable efforts; the HP Envy X2 and Surface Pro spring to mind as decent efforts at marrying computing and touch, but for every neat portability trick is a usability nightmare and sticking with the old fashioned clamshell laptop design hasn't led to a happy matrimony. Acer's back with its updated range of touchscreen devices, the king of which is the interesting Acer Aspire R7. It's very much a laptop device – at 15.6-inches that should be no surprise – but with a nifty design that pushes touchscreen to the fore, without castrating its usefulness with an uncomfortable keyboard or by killing the trackpad. To try and tackle the touchscreen problem, Acer has employed a 'four-in-one design' with its new Aspire R7, which it believes offers the maximum versatility for maximum comfort. These four modes include 'notebook mode' which does exactly what it says on the tin, but adds 'Ezel mode', 'display mode' and 'pad mode' to its repertoire. Ezel mode's name derives from the 'Ezel hinge' which elevates the screen above the keyboard, enabling you to pull the display forward, creating a more natural angle for using with your fingers. The hinge then allows for a host of other positions, such as the classic laptop look with a full-sized qwerty keyboard, or completely flip it over, in a move reminiscent of the Lenovo IdeaPad Yoga. One of the biggest challenges of the keyboard and touchscreen marriage 'the zombie look' (Acer's words not ours) where users have to hold their hands forward to interact with the panel. It usually means that they forgo the touchscreen and revert to the trackpad, but one of the most revolutionary changes Acer has made to the R7 is that it's pushed the trackpad back towards the rear of the laptop and brought the keyboard forward. The keyboard is large and spacious, but the keys don't offer much travel or cushioning, and we much prefer the luxurious feel of the Dell XPS range. The Acer's keys lack quality and if you're a regular typist you may want to give this serious consideration. It may look like the laptop's been assembled backwards, but it means the screen can sit just behind the keys at a usable 45 degree angle. The result makes for a decent experience, and Windows 8 is refreshing to use on a full-sized screen. Other than ezel mode, there's display Mode, which enables you to flip the screen over, for a more tablet-style experience, which is more suited to watching movies or playing games, be it through the Windows Store or full-blooded titles. Finally, there's 'pad Mode', where the screen can be pushed down and forward, lying almost flat, turning it into a 15-inch tablet. It offers a slight angle, which is useful if you are resting on the desk. Of course it's completely unsuited to tablet usage, such as sofa surfing or on-the-move gaming. It's actually quite an over-bearing experience standing in front of the Aspire R7, wondering where exactly you should place the screen. The good news is there's no give in the hinge so there's minimal wobble when touching the screen, but it took some time to discover the angle we felt comfortable with. For a 15.6-inch device, the Acer Aspire R7 is pretty heavy, weighing in at 2.4kg, you'll certainly notice it in your bag. This kind of weight harks back to the bad old days of chunky laptops, and we've become accustomed to a bulk south of 1.5KG with modern Ultrabooks. The pay off, however, is a fearsome spec that will challenge laptops like the MacBook Pro for power. If you're looking for real power for image and video editing and other creative tasks, the headline story is the Nvidia GeForce GT 750M on board. It's got 2GB of memory, giving the Acer Aspire R7 a quality USP. This graphical power is backed up by an Intel Core i5 processor, with options to add up to 12GB of RAM, up to 1TB hard drive and a 256GB SSD. 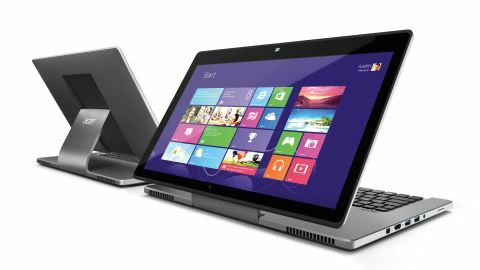 As we've come to expect from the current crop of Windows 8 touchscreen products there's a full HD 1,920 x 1,080 touchscreen display. It looks great, showing off Windows 8 in all its flat-designed glory, and makes using apps a pleasure. We didn't get the opportunity to play movies, but its clear that this panel is up there with the gorgeous Dell XPS 15z. Unfortunately, it doesn't match the MacBook Pro for build quality, and there's a plasticky feel to the silver case. When the laptop's opened it looks intriguing and space age, but when it's closed it reminds us of the awful Acer Iconia 6120 from 2010. Connectivity is good, and you'll find a HDMI port, SD card reader, audio jacks, three USB ports, WiFi, Bluetooth and a convenient converter port supporting VGA, RJ45 and USB. All things considered Acer is to be applauded for offering a different take on the laptop experience. Here there's a concerted and genuine attempt to be open, to embrace those that want a laptop, but to make it easy for people to use touchscreens. Part of Windows 8's rocky road has been due to an authoritarian dictation of how people 'should' use their laptops, such as removing the Start menu and putting Metro front and centre. The Acer Aspire R7 lets you work in nearly any way possible, and we're looking forward to putting it through its paces in a full review.